Posted: Sunday, September 25, 2016. 8:15 am CST. Posted: Sunday, September 25, 2016. 8:14 a.m. CST. 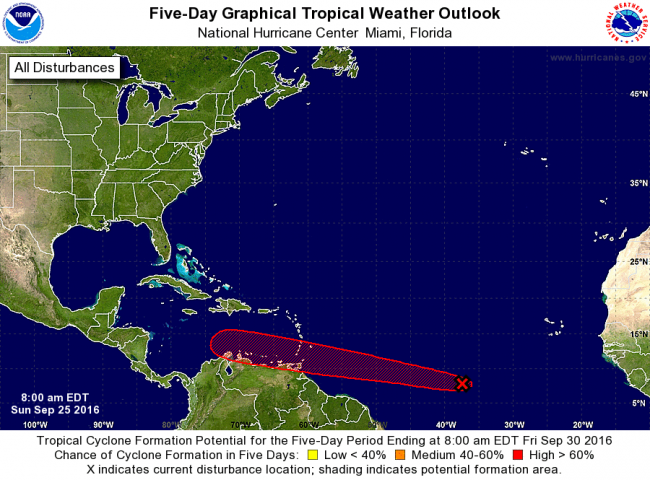 By BBN Staff: The tropical weather outlook is for disorganized showers and thunderstorms associated with a tropical wave located about 1000 miles west-southwest of Cabo Verde Islands moving westward at around 20 mph. The tropical wave, Invest 97 L could develop into a tropical depression or tropical storm and become “Matthew” later this week in the Caribbean Sea. The National Hurricane Center has given it a high chance of formation into a tropical depression over the next 2 to 5 days. It is expected to arrive at the Lesser Antilles by mid week. Showers and gusty winds are expected in St. Vincent and the Grenadines, Grenada, and Trinidad and Tobago, Wednesday into Thursday. It is projected to become a tropical depression or tropical storm Matthew by Thursday as it moves into the eastern Caribbean sea. There are currently west to northwest winds aloft over the Caribbean Sea, providing some wind shear which is typically hostile to the development and intensification of tropical cyclones.